A blog is one of the most important Internet marketing tools you can use. Think of a blog as an online journal, where your articles are loaded with rich keywords that are easily accessible by search engines. Blogs can be used to educate patients about various dental topics, as well as the happenings of your office. Patients love learning more about you and glimpsing behind the scenes of your practice, but the best part is that Smile Savvy’s blogs help improve your ranking on search engines. While you can always add information to your blog, we write your blogs for you, so you never have to worry about what to post. 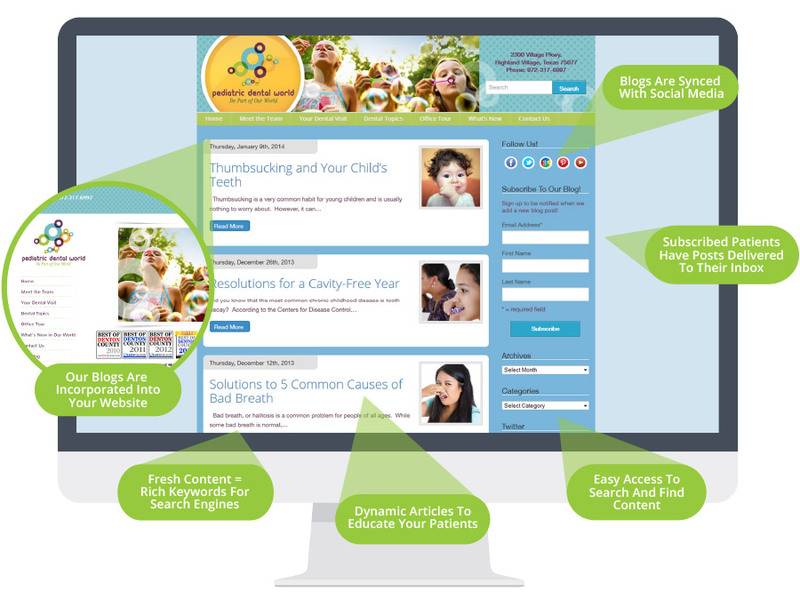 Search engines love fresh content provided through our bi-monthly posts that follow the AAPD guidelines. Our blogs are hosted on the same server as your website, so each post is viewed by search engines as a completely new page. Blog posts are loaded with rich keywords that search engines value, and internet users look for. We can integrate your blog posts into an eNewsletter for your patients. A Smile Savvy blog is the center of your social media hub because it’s connected to all of your social networks. These links are important for better search engine ranking. The average life span of a Facebook post is three hours. The average tweet lasts less than an hour. Blog posts never stop working for you. Add a blog to your existing Smile Savvy website for better SEO.